This is my own creation, though I will admit to being inspired by a great brunch in Vancouver earlier this Spring. If you get up to Canada, you got to go to the Medina Cafe. It was an incredible meal and the place was packed! We waited over an hour for a table, but I would definitely do that again to eat there. It was worth it. Best mini waffles I've ever had, served with a caramel peach sauce... but you have your choice of about a dozen other amazing sauces. Just order a side... like toast. Haha. While they are famous for their waffles, it's the breakfast paella that blew my mind and kept me thinking of it again, and again. 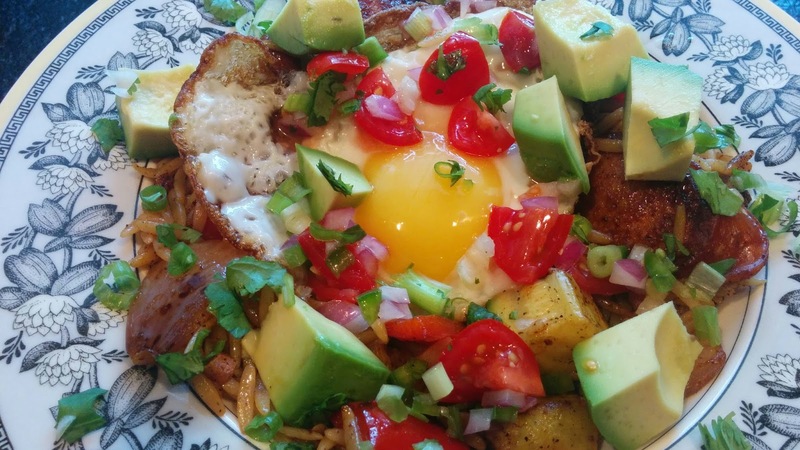 What an easy and interesting way to get some different, exotic flavors into your brunch menu. This would be easy enough without meat too, just do it with veggies, salsa and a crispy fried egg! NOTE: Crush and soak saffron to release its flavor. Saffron threads are quite frail and can easily be crumbled between your fingers, although for a more uniform powder, use a mortar and pestle. Measure (or count) saffron threads before crushing. A "pinch" is about 20 medium saffron threads. Boil about 1-2 quarts of water, cook orzo for 6 minutes. Drain. 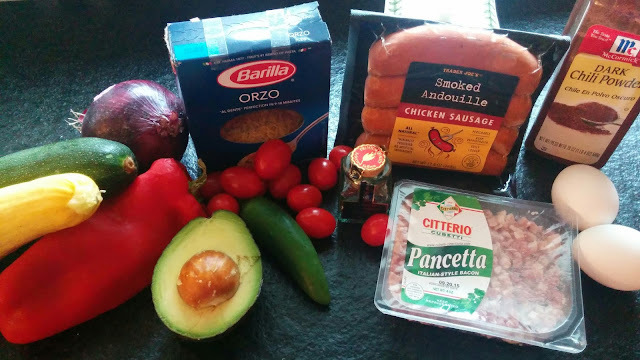 While the water is boiling and the orzo cooks, prep the salsa so that the flavors have time to meld. 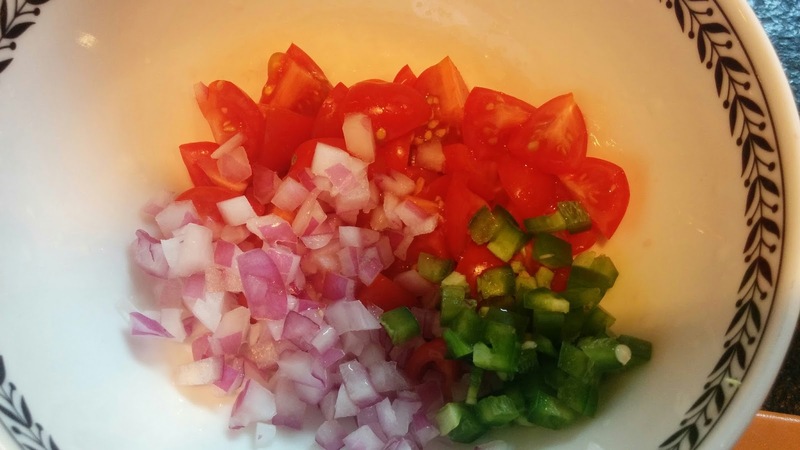 Add minced tomatoes, red onion, jalapeno and fresh cilantro. Juice 1/2 a lime in the mixture, adding salt and pepper. Stir and let sit while the rest of your meal cooks. 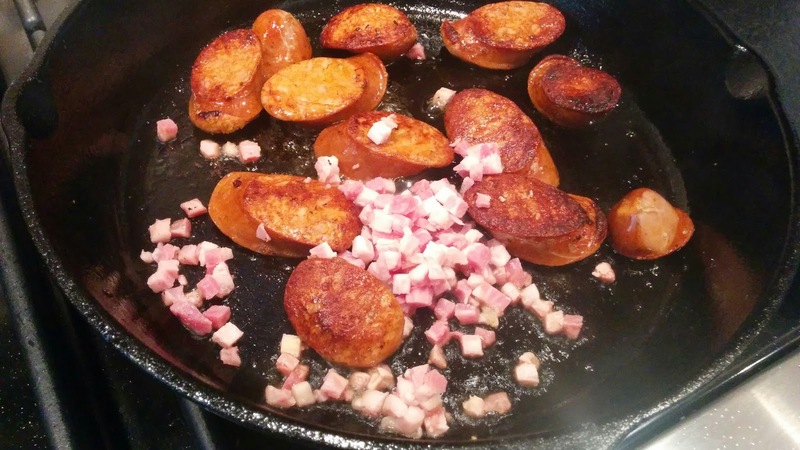 Add bacon and cook for another 2-3 minutes, take off heat and add to a plate, reserving it while you cook the veggies next. Cook veggies in the same pan, try to get some color/crust on the veggies. Try not to over cook the veggies. Sprinkle with chili powder and saffron/water mixture. Add in the reserved meats, and stir. 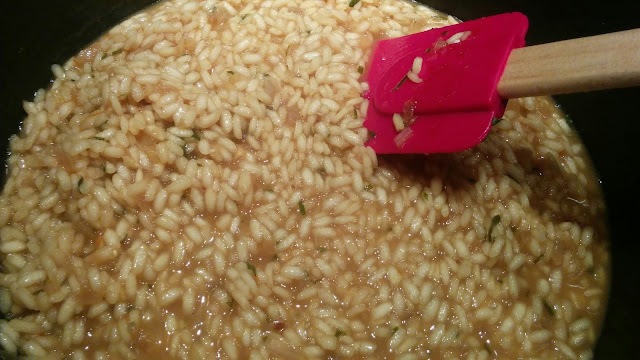 Add in the cooked orzo and mix. Add salt and pepper to taste. Cover with a "tent" of foil, or a lid while you fry eggs. 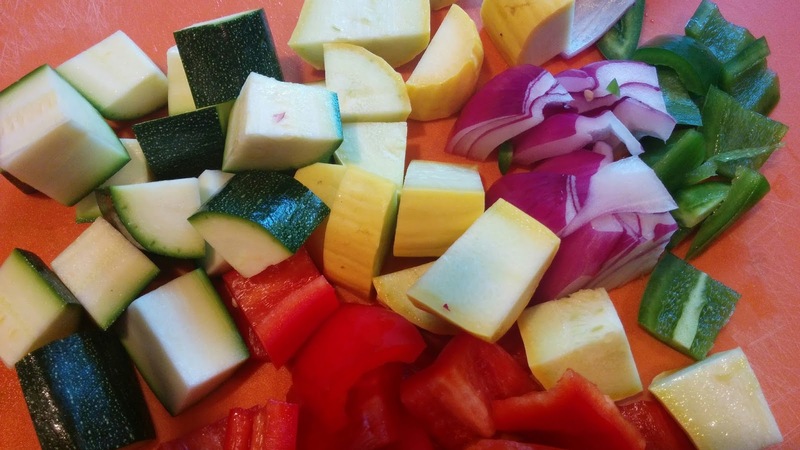 Here's a photo of the veggies before I started cooking. I did some pretty big chunks. 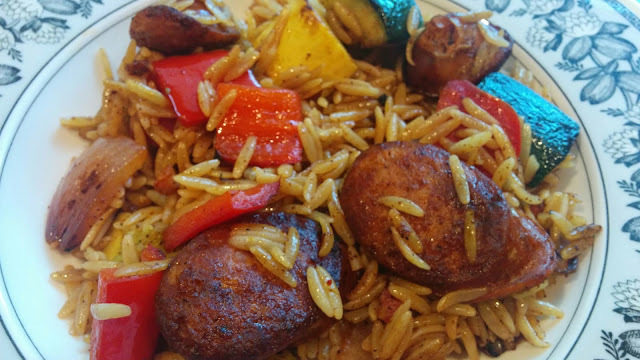 Crispy fry eggs, serve on top of orzo, veggie and meat mixture. Sprinkle with fresh salsa, avocados and chopped cilantro. Here's a shot of the orzo, meat and veggie mixture before adding the egg. This was great reheated the next day for lunch (but without the egg), I just added a dash of hot sauce and was incredibly happy with it. 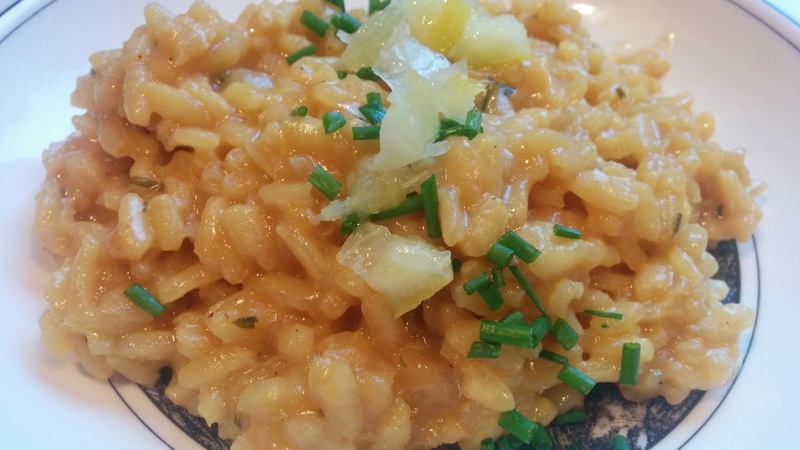 Making risotto is just a comforting thing to do. 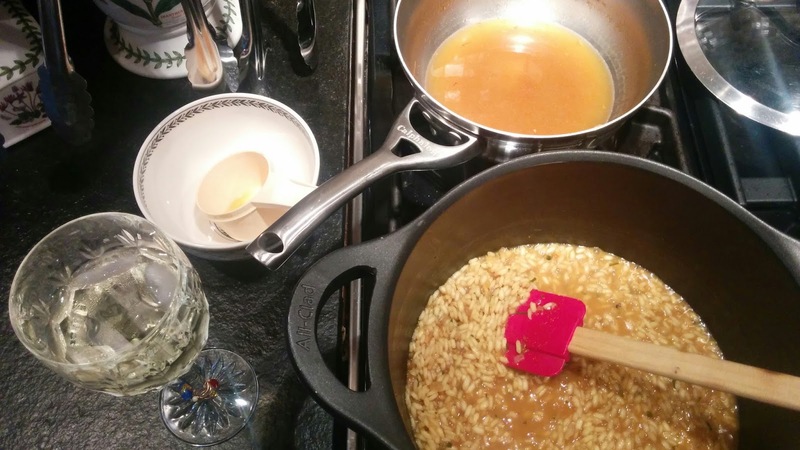 Something about all the stirring and tending to the mixture by adding the wine and broth a bit at a time, stirring all the while. This was a perfect rainy Friday night dinner "in" with a grilled steak recently. I froze the leftovers (in a flat ziploc freezer bag) so that I can have a quick side dish some other night. Feeling a bit happy to know it's in there waiting for me. I made preserved lemons about a month or so ago, so lately, I've been looking for ways to use them in lots of recipes because they taste so good. I've been told you can also buy them at a gourmet grocery store, but I have never seen them there. My recipe for preserved lemons is here, if you want to give them a try. I used a recipe for the risotto from Sunset Oct 2011 Original recipe was in Sunset magazine, My only changes to the original were not adding any extra salt, but adding the salty preserved lemons instead. Bring chicken broth to a boil in a medium saucepan, covered. Add saffron and reduce to a bare simmer, covered. Melt butter over medium heat in a heavy-bottomed 8-qt. pot. Add onion; cook until translucent and turning golden, 10 minutes. 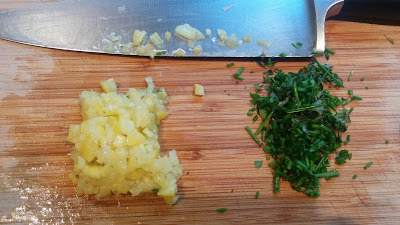 Stir in thyme, chives and preserved lemon. 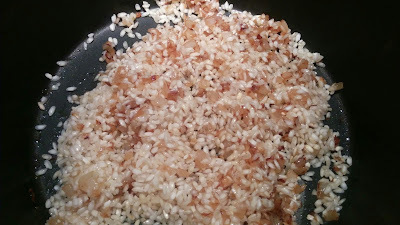 Add rice and cook, stirring constantly, until edges of grains look translucent, about 2 minutes. Add wine to rice and cook, stirring, until wine is completely absorbed. Add about 1 cup hot broth and simmer, stirring, until absorbed; reduce heat to medium-low if mixture starts to boil. Keep adding broth, a ladleful at a time, stirring until each addition is absorbed before adding the next, until rice is just tender to the bite and still slightly soupy, 15 to 30 minutes. 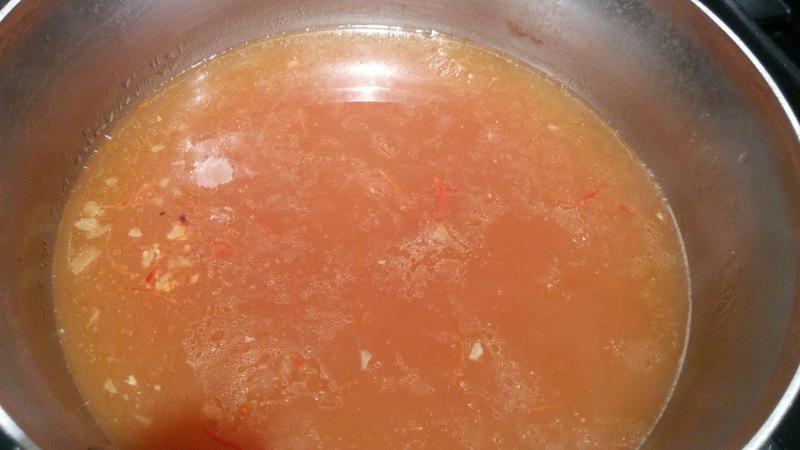 You may have broth left over. Remove rice from heat and stir in cheese, sour cream, pepper. 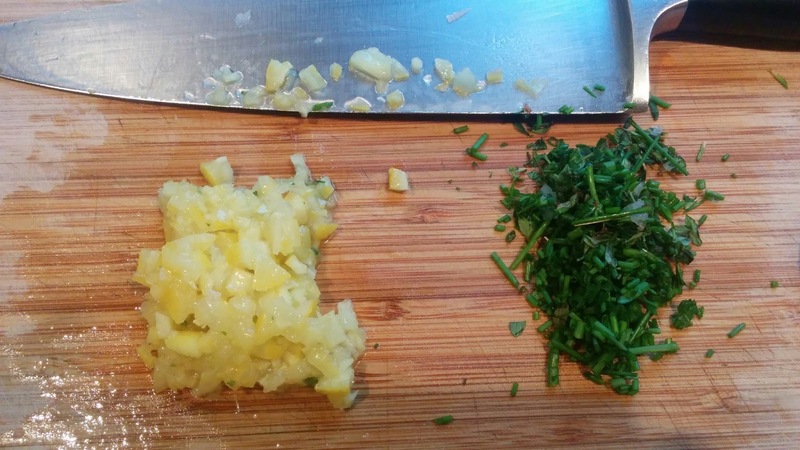 Scatter more chives on top. Great on it's own, but would also be wonderful as a side dish to grilled scallops, fish, steak or chicken. Note: Adding the cheese and sour cream "tightens" or thickens it up, so I'd suggest that you error on too soupy, rather than not soupy enough. Here's a photo proving I cook with wine... sometimes I even put in it in the dish!